I have no doubt that any man who knew him could write an appreciation of our late dear friend Roddy Macleod. All would be different and yet the same. This is therefore my appreciation. Roderick J Macleod was born on 11 October 1939. He died on 20 December 2013 aged 74 years. Roddy was brought up in the Battery at 11 Battery Park Road and it was from that address that he made his final journey after returning there some years ago with his young family. He loved the Battery and his great affection for it found expression in the four excellent articles he contributed to Back in the Day. He demonstrated a warm relationship with Battery people whom he hunted down in order to make sure his facts were right – attention to detail as always. I knew of him first as a big guy in school who played for the football team. I knew too that he could kick the ball with a terrible ‘brack’. He played for the school team until its demise. He then played for United and for Lochs in the Eilean an Fhraoidh Cup. He played over the years with distinction and he often told us of the occasion when he captained the Lewis Select. The pre-match photograph had the ball lying on the ground in the middle of the photo just where Roddy sat as captain. Some wag, after the game, is reputed to have observed ‘it was the only time in the game when Barts had the ball at his feet!’ He told that joke about himself and his was the loudest laugh of all. And flashed and flattened up towards the light. But for Roddy it was more than the fishing. It was important to him that the clubhouse be built. It was a community effort with men giving of their time and expertise. He told one story of how he was on the roof with several men when they spotted a member’s boat on the shore and newly painted in beautiful ‘council green’. It was important that the club be run well and Roddy ensured that it was secure because only then could it attract national and international interest. Recently when the club had its 50th anniversary, he came straight off the ferry to join the festivities. Roddy too was a keen loch fisherman. When Eddie Young came to be Rector of The Nicolson Institute, a bond quickly formed between the two men because of their enthusiasm for loch fishing. At the time of the reorganisation of local government in the mid seventies, TNI was charged with accepting all senior pupils from all over the Western Isles. Roddy as Head of the Senior School accompanied the Rector on trips to the south. Never did they travel without their fishing rods and a life-long relationship with the fishing fraternity was formed. Another good friend from the fishing fraternity was John M Macleod, Luerbost. These three spent many happy hours on the banks of lochs or in boats. I think they completed Eddie Young’s education on these occasions. Roddy had a great relationship with his brother-in-law DK Macleod, born out of having a share in a boat, I heard, as the years went by, of the preparations, the transportations, the aggravations and the wonderful pleasures of sharing a boat. And finally, on the fishing theme, there was the fly-tying. He did it for pleasure and for himself but the teacher in him ensured that he ran evening classes so that others could benefit too, and so he expanded his circle of friends even further. He was happy to do fly-tying demonstrations and did so even to audiences comprised solely of women whose only connection to fishing was cooking the product. When I joined TNI in 1969, Roddy was my mentor in a very good mathematics department. If I had any problem with any matters mathematical or administrative, he was my first port of call. Already he was building a reputation for being effective and efficient both in the classroom where he had excellent results, and in his involvement in wider school issues. We both joined the new Guidance System in the mid seventies and his role with the senior school began. Not long after he became assistant rector he built up The Nicolson’s teacher/ pupil support system for older pupils which served, at one point, the largest senior school in Scotland. (The Nicolson Institute having the biggest senior population in the whole of Scotland at this time.) This lasted until six-year secondary schools were built in Harris, Benbecula and Barra. His reports, personally written for all senior pupils, were fair, balanced and supportive. He worked with Eddie Young and Alan Whiteford to ensure that The Nicolson Institute was famed throughout Scotland as a school of excellence. Even then he could not resist being involved in all manner of extra curricula activity – staff functions, trips to Valtos Outdoor Centre, the Bog Slog, the University Trips and the Pendleton Exchange to name just a few. He was very proud of The Nicolson Institute. He spent his entire, and very successful, teaching career there -something very unusual in the Scottish teaching profession. When the name of the school, and indeed its very existence, was in jeopardy, he immediately offered his front room as campaign HQ. He was delighted when the Comhairle reversed its decisions. Roddy became secretary of Probus on 22 January 2004. He planned to retire from the post on 23 January 2014 – ten years, almost to the day. Typically humorous and understated. I joined Probus in 2004 and became president in January 2007, by this time Roddy had changed how Probus operated out of all recognition. 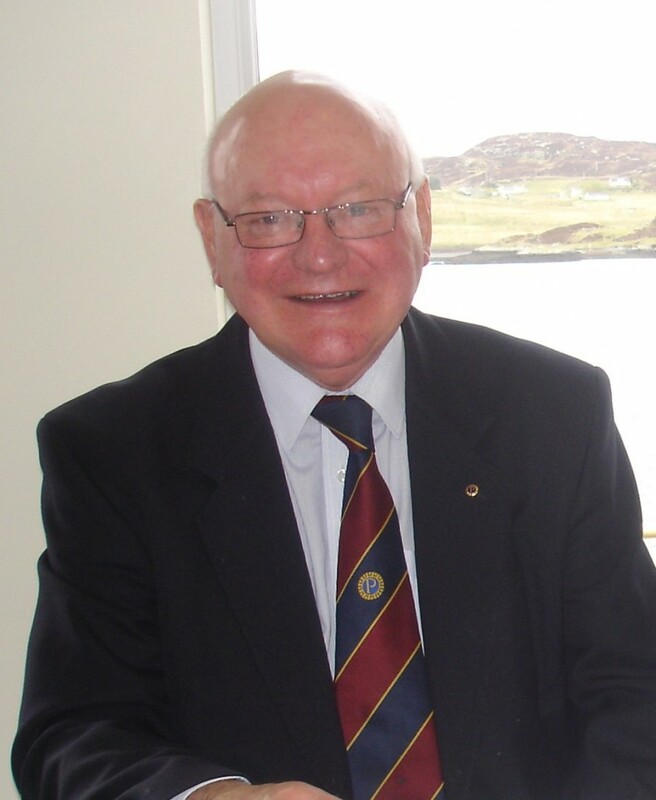 Those who had been in membership for some time before he arrived described his effect on Probus as ‘transformational‘: never before had there been such a regular supply of quality speakers, never had there been so many local trips and so well organised, nor indeed off-island trips such as those to Pitlochry, to Eriskay – where he persuaded Willie Buchach to tell his story of the politician- and in this case Roddy even had the sunshine laid on, and last year there was the wonderful Orkney trip. To give you an example of his commitment to the club, permit me to use my presidential year to exemplify. In that year alone there were 11 visiting speakers, four local visits including an overnight in Harris and the exceptionally well organised trip to the Edinburgh Tattoo and not just the tattoo, he also arranged, for those who wished, to visit the Scottish Parliament building. You may recall that while he was arranging all of this he was also arranging a two month visit for himself and Anna to the antipodes which was also a huge success. So pleased was the club with his secretaryship to that date (a three year period) that it was agreed that he be presented with a gift in appreciation of all his hard work. The presentation took place at the Christmas dinner in December 2007. He was completely taken aback but loved the painting the club had especially commissioned for him and he was most impressed by our subterfuge. Roddy loved there to be entertainment and no event was complete without some form of turn from within or outwith the club. He just loved all our occasions and he wanted everyone else to enjoy themselves too. He it was who introduced, through me, the formal presidential start to each meeting which is still used today. He introduced the sound system to aid the hard of hearing. He urged that we buy a projector for use by visiting speakers and of course, he introduced the pocket card with members’ names and contact details, the committee members and the constitution. All innovative and enduring. He was never stuck for an appropriate remark or anecdote to fit whatever occasion arose. He happily stepped into the breach if there was no speaker and willingly offered votes of thanks and sometimes these were more edifying and entertaining than the speaker. His passing is a great loss to our club. It is a significant loss to our community where he was involved in so many spheres over many years. Five years ago The Hebridean Mens Cancer Support Group was struggling. It was an excellent initiative by Sandy Matheson but it was proving difficult to make contact with men who had cancer and to persuade them to come along to drop-in sessions. Roddy agreed to become secretary ‘for a year’ and he died in post. He did not have cancer but just wanted to help. Again his involvement was transformational. On my joining the club there were seven members present: now over 20 men meet every Friday afternoon to support one another. He was not satisfied with that and he sought to expand our message by proposing outreach visits to Harris, Ness, Uist and Barra to encourage men to participate in supporting themselves. Nor was local activity enough. He organised for HMCSG to attend the Scottish National Conference of cancer support groups. His infectious and outgoing personality ensured that he made friends with everyone and HMCSG became the go-to group at conference. HMCSG is the only solely men’s cancer support group in Scotland and we were asked all the time how had we achieved our success. Well, he would not allow us to say this, but it was largely down to his efforts. Needless to say eventually he was whispering in my ear, “we need to do the Para Handy skit at the conference!” Well how could I say no? He wrote a script which poked gentle fun at well known members at conference and we brought the house down! At present five of us are dealing with the fallout from Roddy’s passing as it affects the cancer group. Consider how, at every function he attended, he worked the room. Could not sit still for a moment. Always chatting, telling tales, laughing and enjoying himself. That is a good memory. He took me home on the Friday before his stroke. “I love this van,” he said. “Don’t know why I did not buy one years ago!” And knowing I was to go on holiday the next Monday he said: “I will call you before you go.” It was not to be. I miss Roddy. But I will remember a good colleague, a great friend, a man who gave so much of himself for the benefit of others and enjoyed every minute of doing so. He was efficient, effective, committed but above all else he was a really nice guy. Roddy is survived by his wife Anna, his daughters Janet, Mairi and Alison, his sons-in-law Reuben and Angus and by his grand children Eve, Gregor, Derek, Ellen and Jane. He loved them all and spoke of them on so many occasions, always his stories were interesting, entertaining, informative, never boastful. How they will miss him and how we all will miss him. His was a life well lived.